The Charley Harper Cardinals Consorting needlepoint design is professionally hand-painted onto 13 mesh Mono Zweigart needlepoint canvas. Each stitch is painted a specific color so there is no guess work as to what color goes wear - easy for beginner needlepoint artists! The design features two cardinals consorting on a branch of a buckeye leaf with an intense sky-blue background. The needlepoint design area measures 9.5" x 13". If you require stretcher bars to keep your canvas taut while you stitch (optional - you can absolutely work this in hand if you prefer) we recommend a pair of 13" and a pair of 17" with thumb tacks. 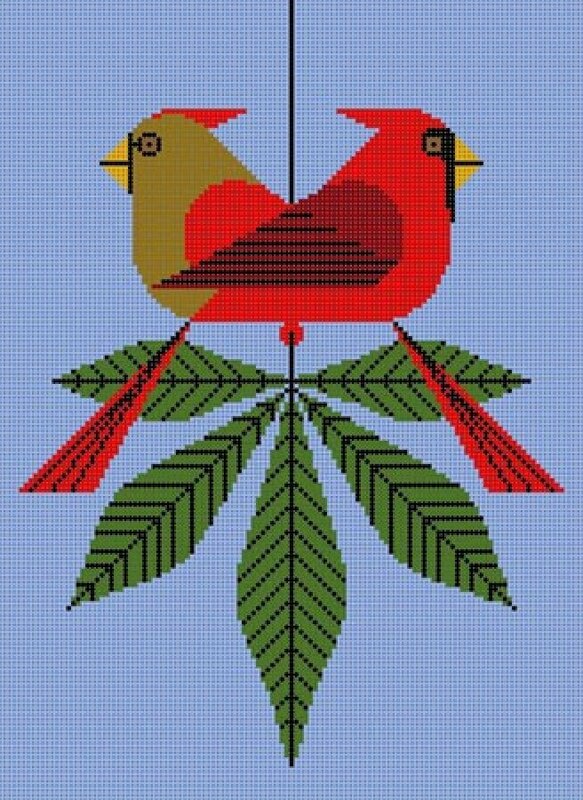 This Cardinals Consorting Charley Harper needlepoint canvas is usually in stock and ships within 10 days. However, due to the popularity of Charley Harper canvases it is subject to back order so if you're in a hurry let us know.